A home can be as relaxing as you want. Through the decoration you can create serene environments where you can disconnect your mind and forget everything. 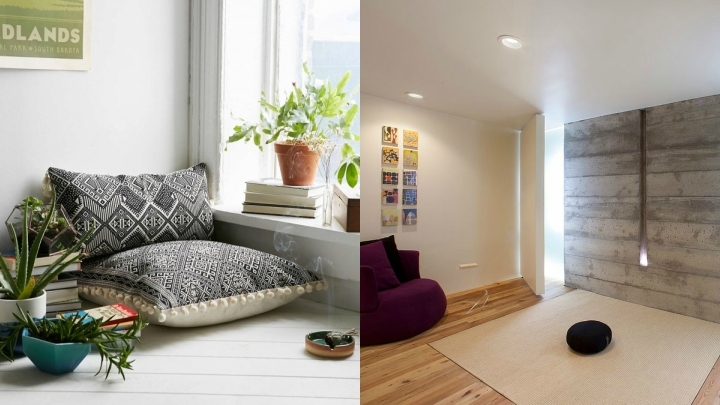 If you like to practice yoga at home you have several options to design a corner of the most special for it. 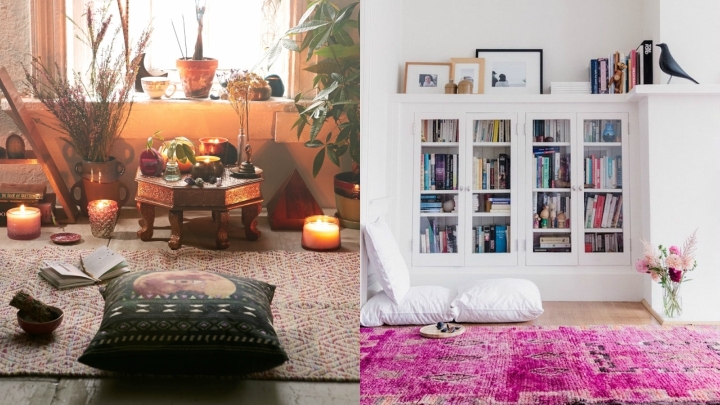 I’m going to give you some ideas that you can use in a room so that it becomes a peaceful refuge to meditate and breathe. If you have the option to choose which room you will use to do yoga at home, choose the one where the least noise will be heard. Of the street, of the neighbors, of those who live with you … That has a lot of natural light and an amplitude enough to find you comfortable when executing the asanas. The colors of this room should promote relaxation, so soft, neutral and clear are welcome. Choose matte tones because bright colors do not favor calmness. 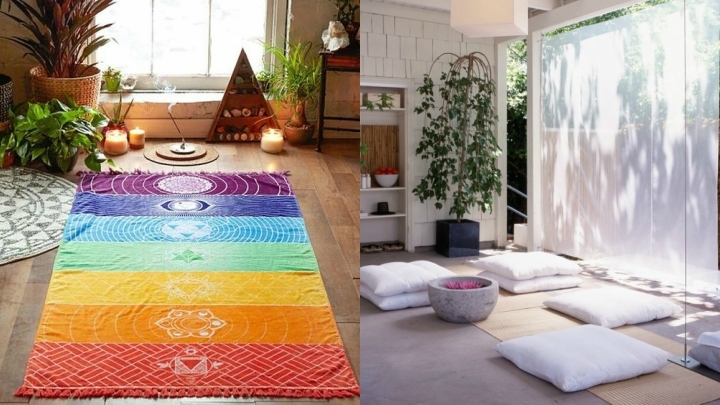 As I’ve anticipated before, colors play an important role in the decoration of your yoga space. We already know that they can influence our mood, and now we look for tranquility. That’s why soft tones will be successful. The violet, for example, is a color associated with mysticism, so in this room is going to be great. You can also play with the tones of the chakras: red, orange, yellow, green, blue and violet. And, of course, white, the color that is identified with purity, clarity and light. The wood is the most welcoming and warm material. It would be ideal if you were very present in your yoga room. If the floor is made of wood, great. Choose some wooden furniture, not too big, where you can store your things and place a decorative object. If you want to add some textile choose natural fabrics such as cotton or linen, for example. It is about that we relax so it is not necessary to charge the room with many things. But you can introduce small elements that propitiate the serene atmosphere we seek. You can put some candles so there is a dimmer and more comfortable light. You can also light a Himalayan salt lamp or decorate with a figure, a green plant or a fountain. If you have space a mirror will help you to correct the postures you make. A painting with a mandala will add a touch of color to the room. There will not be missing your mat and some cushion or pillow that will give extra warmth to the environment. Also, put a small music player where relaxing melodies sound that you will hear when you start practicing yoga. As I have already mentioned, the aroma of your house is part of its decoration. If you want to add a touch of smell to your stay so that it contributes to your relaxation while you practice yoga you can place some incense or aromatic candles. Of course, be very clear that the smell you like and comforts you, because if we are not going to get the opposite effect and the environment will be saturated. ← What are the pros and cons of silicone hoses?